Y’all, I took another trip to Richie Rich’s house! You know that cartoon from the 90’s, Duck Tales? There was a character in the opening credits that would dive into his massive vault of gold coins and swim. Well, that’s what this house reminds me of. Anyway, this time I spent a lot of time in the conservatory and gardens because spring has sprung and it is BEAUTIFUL! From a scene between William Wilberforce and his butler in Amazing Grace. Amazing Grace is one of my all time favorite movies. Not because it’s enjoyable, but because it shows God’s work through the life of one individual who dedicated his life to changing the world. The above scene resonated deep within me. Because that’s exactly how I feel sometimes. I have tons of responsibilities and issues screaming for my time, but I would rather admire the works of God! So, on this trip to Biltmore, with no children with me, that’s exactly what I did. The conservatory was full of beautiful plants including a variety of orchids. Orchids. Orchids. Orchids every where. I loved the Lady Slipper Orchids. I felt like I was looking at some strange creatures instead of flowers. All I could think of when I saw these blooms were spiders. When I later tried to identify them, it came as no surprise that’s what they’re referred to. Go figure. I felt a little like Alice in Wonderland when I walked by this gigantic plant. 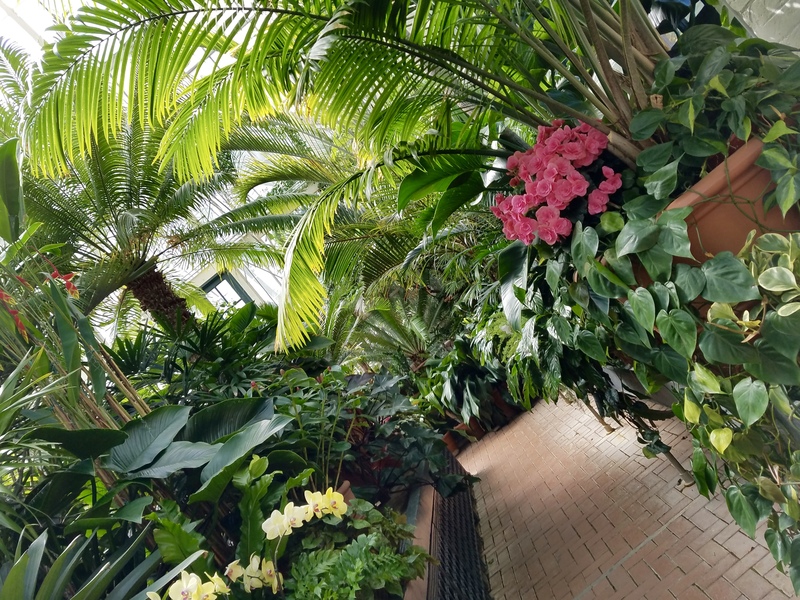 Biltmore’s conservatory is so big and has so much to view, you could get lost in it. Like in a maze. Because I did. I was so content admiring God’s art work that I didn’t realize I got separated from my crew. Or that I was taking a long time. I laughed at what I found when I stepped out of the conservatory. The girls were waiting very patiently.